Cape Air is one of the last great independent commuter airlines, operating a massive fleet of Cessna 402s across New England, the midwest, the mid-Atlantic and the Caribbean. The airline also flies Britten Norman Islanders and ATR 42s. The company began flying in 1989 between Provincetown and Boston, filling the void left by the demise of the legendary PBA. The airline quickly expanded into other former PBA markets across Cape Cod and moved into south Florida in 1993 and is now one of the largest independent regional airlines in the United States. Cape Air discontinued all service in Florida in November 2013. Below: This has to be one of the most spectacular paint jobs to ever adorn an airliner! Nicknamed the "Fantasy Flyer", it displayed the flag of the Conch Republic, Captain Tony, parrots, underwater life and more. The aircraft was flown between Key West, Ft. Myers and other points in Florida. Photo courtesy of Cape Air. The other side of Cessna N67786 featured more fantastic artwork including a portrait of Ernest Hemingway. 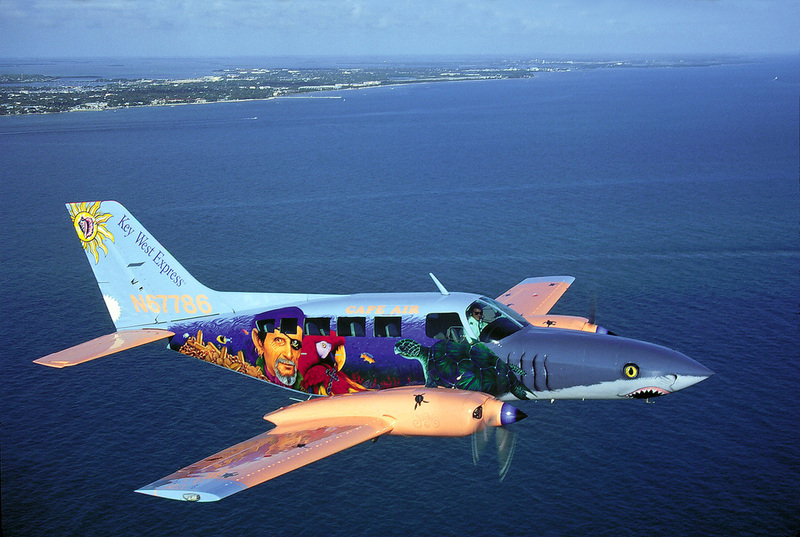 The man in the doorway is the renowned artist Jürek who painted this aircraft and several others for Cape Air. Check out jürekart.com to see more of his great work. Cape Air's Florida route map from 2000 showing service to Key West, Naples, Ft. Myers, and Ft. Lauderdale. Here's a collection of Cape Air timetables covering the period from 1996 to 2005. Many thanks to Arthur Na for the dozens of timetable scans he has contributed to this website. Timetables from his collection are noted with an asterisk. 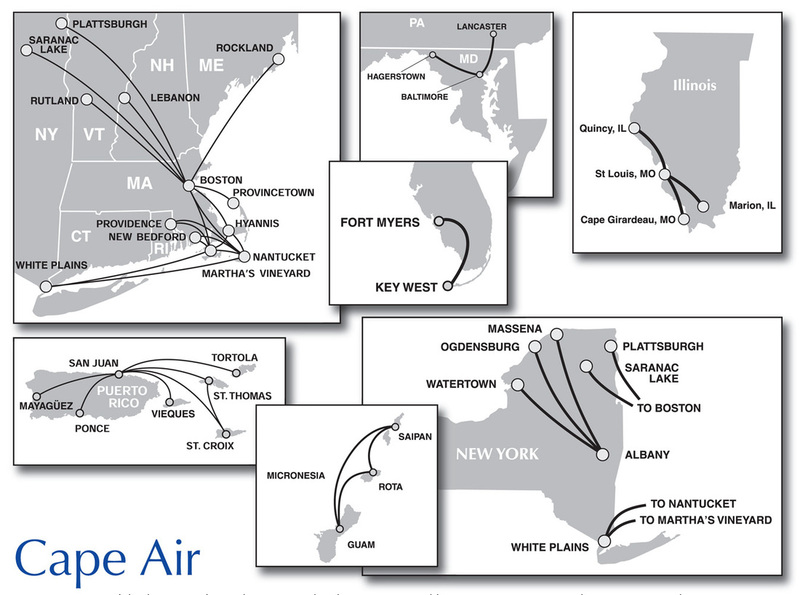 Cape Air route maps from 2010. Florida service had been reduced to a single route between Key West and Ft. Myers and was discontinued completely in November 2013. Cape Air no longer flies in the Sunshine state. For additional timetable images and information, visit the Cape Air page at Timetable Images.